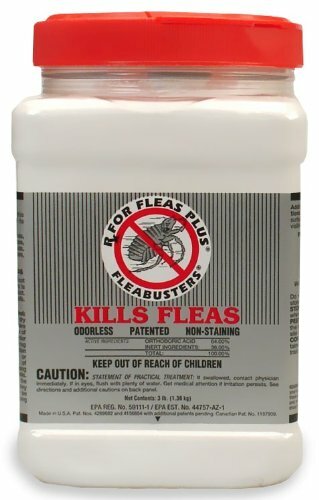 Fleabusters® understands that special bond between you and your pet, and we know that one important way to maintain that bond is to keep your dog or cat free of the discomfort and menace of fleas with our Fleabusters® Rx for Fleas powder. It is a unique alternative to liquid pesticides and foggers. Our flea powder cannot fail as it kills fleas physically rather than chemically, thus fleas cannot build up an immunity to our product. Fleabusters® has been around for a long time. It may take up to three to four weeks to completely eradicate your flea infestation but eventually it absolutely does work. For you cheapskates, don't waste your time on mixing baking soda with salt - it does not work. Buy the Fleabusters. It's worth it. Don't hesitate to buy this RIGHT NOW!!! This stuff is AMAZING!!! Application wasn't that bad. Works great. I've only seen two fleas that weren't in good shape since applying almost 2 weeks ago. You do have to vacuum every 2 days though for best results.